Mark Hamill's performance in Star Wars: The Last Jedi was pretty amazing. To see somebody who was so full of hope in the first Star Wars trilogy go from that to the broken, disheveled man we see on Ahch-To is fascinating. Luke Skywalker has been through hell and he doesn't appear as if he has fully returned when Rey, Chewie, and R2-D2 come to ask for his help. Mark Hamill had to channel some dark times to get where he needed to be to play the broken-down Jedi, but knowing the actor's sense of humor, he also had to have a different creative outlet on the movie. Eagle-eyed moviegoers who stuck around hoping for a Marvel-like post credit scene noticed that Mark Hamill also plays a character named Dobbu Scay. Who the heck is Dobbu Scay? While the credits are rolling, Mark Hamill's name comes up again as Dobbu Scay, which is surrounded by other names of actors who appeared in the Canto Bight Casino scenes. We see character names like Canto Cop, Stable Kids, Stable Boy, Jail Guard, and Party Girl Lovey who is played by British model Lily Cole. This leads us to believe that Hamill's Dobbu Scay character also appears on Canto Bight. But which character is he? There are SPOILERS ahead for The Last Jedi, read on at your own risk. For any fan that follows Mark Hamill on Twitter, you know that the man has an awesome sense of humor, especially when it comes to the Star Wars universe. In addition, the actor has had some pretty famous voice acting over the years, most famously as the Joker. Now, the rest of this is pure speculation, but all of the evidence collected above leads us to believe that Hamill played the voice of a character and something humorous at that. 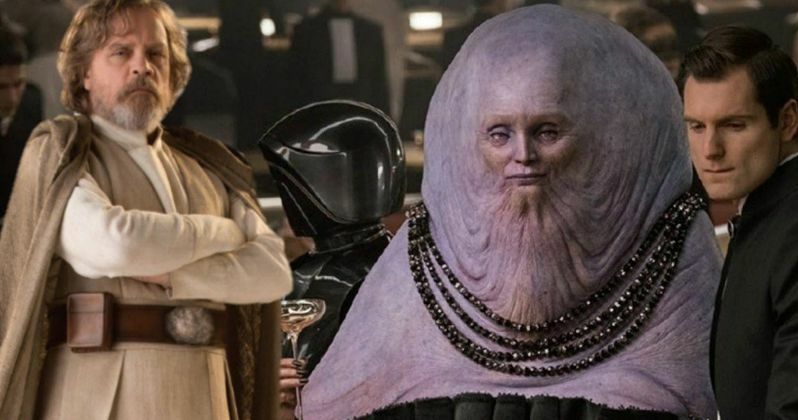 Many have criticized the Canto Bight plot as being unnecessary, but there are some pretty good areas of comic relief included in the casino. Conclusion: Mark Hamill provides the voice for the drunken space leprechaun that feeds BB-8 all of the gold coins. Think about it and search your feelings, you know it to be true: Dobbu Scay is the space leprechaun. It's the only thing that makes sense and it's just wacky enough to be Hamill as it suits his sense of humor. At first glance, the character comes off as a troll, something that Mark Hamill has perfected over the years on Twitter as the good hearted Star Wars troll. All we need to do now is get confirmation from Hamill himself. There's really no other character that Dobbu Scay could be that would hold enough weight to be mentioned in the credits. However, this could all be an elaborate trolling from both Rian Johnson and Mark Hamill... we'll keep our eyes peeled for more clues, but for now, we believe that Hamill is the infamous drunken space leprechaun, Dobbu Scay. You can check out Hamill's name in The Last Jedi credits below, courtesy of Doug Bowman's Twitter account.